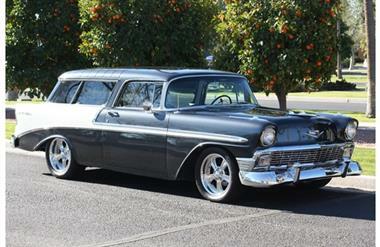 1956 Chevrolet Nomad in Goodyear, AZ for sale. Chevy Nomad Bel Air. Beautiful 1956 Chevrolet Belair Nomad Wagon. The paint on this is stunning and you wont be disappointed. Charcoal metallic and off white makes this stand out on the road and car shows. Who doesnt like a Nomad? Has most creature comforts of later models like a 350 Chevrolet engine, 350 automatic transmission, 2 1/2 stainless steel exhaust with Borla mufflers, power steering, power brakes (disc in front), Vintage air conditioning, power windows, tilt wheel, CD/radio with speakers front and rear, and 17X8 and 17X10 Billet Specialty wheels with Nitto 245/45/ZR17 and 255/50/17ZR17 tires. This is my favorite of all the cars I have owned through the years. Sorry to have to part with her, but I can no longer work on it and needs to go to a new home. This vehicle is priced $2,247 less than the Average Market Price of $61,747 for a 1956 Chevrolet Nomad. This is a Fair Deal as it's priced 4.0 % below market avg. The Pie chart below shows the number of ads within different price ranges.